Almost two week ago, my husband and I started Project Eat It, Don't Move It. Instead of packing up and moving all of our pantry staples, we decided to use them before our move, so I've had to get really creative in the kitchen. Moving apartments has a surprising effect on my weight-loss efforts. My husband and I are moving this week—it's our second move in the past few months—and to say I'm stressed would be an understatement. So we started packing a couple of weeks ago and cut down the amount of stuff we plan to move—including the food in our kitchen. Almost two week ago, my husband and I started Project Eat It, Don't Move It. Instead of packing up and moving all our pantry staples, we decided to use them before our move. The benefit is two-fold: We're reducing the amount of stuff we have to move to our new place, and we're saving money on our grocery bill for a few weeks. And the less obvious bonus? I've had to get really creative in the kitchen. While not every meal has been the perfect picture of health, I've been able to stick to my diet while eating through our pantry. One night, for instance, my husband and I ate canned soup for dinner, but I threw in some lentils and vegetables to get some extra nutrients. Most canned soups score low in the calorie department, but when it comes to satisfaction, they don't usually fill me up. The lentils and vegetables add some healthy bulk and staying power to my meal. Another way that I have made the most of my pantry staples is by incorporating them into semi-nutritious, unconventional baked goods. While pursing my favorite recipe blogs, I stumbled upon a recipe for Chickpea Blondies from Have Cake, Will Travel. I was certainly skeptical at first—beans in my baked goods!? It didn’t sound like a tasty combination, but I had a can of chickpeas in my pantry that needed to be used. The blondies turned out soft and moist with a sweet, jam-y flavor. You’d never know that chickpeas were thrown into the mix. And just the other day, a lone sweet potato inspired another baking attempt to use up my pantry staples. I whipped up a batch of Sweet Potato Oatmeal Raisin Cookies using rolled oats, flour, brown sugar, raisins, and a random bag of shredded coconut in my cabinets. The cookies tasted like oatmeal raisin cookies, but so much better! Firm on the outside, soft and chewy on the inside, with a subtle sweet potato flavor and bites of coconut and raisins throughout. Of course, I loved using up pantry staples so that I don't have to move them, but it's also been fun to sneak veggies and beans into my desserts! Has moving ever affected your weight-loss efforts? 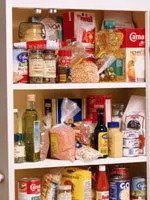 What are your favorite ways to use your pantry's contents? Read Tina's daily food and fitness blog, Carrots 'N' Cake.